Pakistan’s biggest party, the PPP, has nominated its leader, Asif Zardari, to be the country’s president. Pervez Musharraf resigned from the post on Monday in the face of the threat of impeachment by his political enemies. 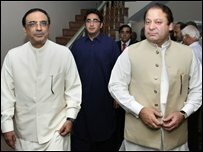 Mr Zardari’s main coalition partner, Nawaz Sharif of the PML-N, is not in favor of Mr Zardari getting the job. The two men are also deadlocked over how many of the judges sacked by Mr Musharraf during emergency rule last November should be reinstated. PPP spokeswoman Sherry Rehman told reporters in Islamabad that senior PPP members had come to a unanimous decision to nominate Mr Zardari. “Mr Zardari thanked the Pakistan People’s Party of which he is the co-chairman and said he will announce his decision within the next 24 hours,” she said. The PPP and the PML-N have been discussing ways to reduce the power of the presidency. But if Mr Zardari gets the job, it is not clear if such reforms will go ahead. He took over as PPP leader after his wife, Benazir Bhutto was assassinated in December. The president is chosen by the two chambers of the national parliament and the country’s four provincial elections. The election will be held on 6 September. Mr Sharif prefers what he calls a consensus president. Earlier on Friday Mr Sharif agreed to let parliament hold a debate next week on how to reinstate the judges sacked by Mr Musharraf. He had threatened to pull out of the coalition government unless it was agreed on Friday that all the sacked judges be restored. The PPP fears that if former Supreme Court judges, including ex-Chief Justice Iftikhar Chaudhry, are reinstated, they could overturn a controversial amnesty that Mr Musharraf granted Mr Zardari Ms Bhutto last year that paved the way for them to return to the country. That would open up Mr Zardari to prosecution on long-standing corruption charges. Mr Sharif pulled back from his threat to withdraw his PML-N party from the governing coalition after talks with other coalition parties in Islamabad. But Mr Sharif is still hoping the resolution will result in Mr Chaudhry and the other judges getting their jobs back. “Wednesday should be the day for reinstatement of judges,” he told journalists. The coalition was elected in February but analysts say it has failed to find solutions to Pakistan’s economic crisis and to the militants in its north-western tribal regions bordering Afghanistan. The politicians’ squabbling is hindering any possible plan for tackling militant violence. The Pakistani Taleban claimed responsibility for Thursday’s suicide bombings on an ordnance factory in the town of Wah, near the capital Islamabad. It was the deadliest attack on a military site in Pakistan’s history. The militant group promised more attacks in Pakistan’s major urban conurbations unless the army withdrew from the tribal areas. 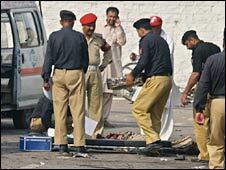 On Tuesday, 32 people were killed in a suicide attack on a hospital in the northern town of Dera Ismail Khan. On Friday the Taleban said at least 16 of their fighters were killed in clashes with security forces in the north-western district of Hangu. In the Bajaur tribal region near the Afghan border, reports said at least one person was killed and eight others were injured when army helicopters fired at a convoy. Locals said the vehicles were carrying civilians who were fleeing the fighting in the area. Mr Musharraf, a key ally of President George Bush’s “war on terror”, stepped down this week after nine years in power to avoid being impeached. He sacked about 60 Supreme Court judges during a state of emergency in November to prevent them from overturning his re-election as president. Analysts say that although the PPP and PML-N worked together to hound Mr Musharraf from office, there is a history of intense rivalry and mistrust between the two main parties. The parties differ over the future of Mr Musharraf, who has been replaced by a caretaker president, the speaker of the Senate. Mr Zardari’s party has said it believes Mr Musharraf may have immunity from prosecution. But Mr Sharif’s party argues he should stand trial for, among other things, abrogating the constitution.